Jake Cuenca Is The Misbehaving Actor In Cinema In This Blind Item? 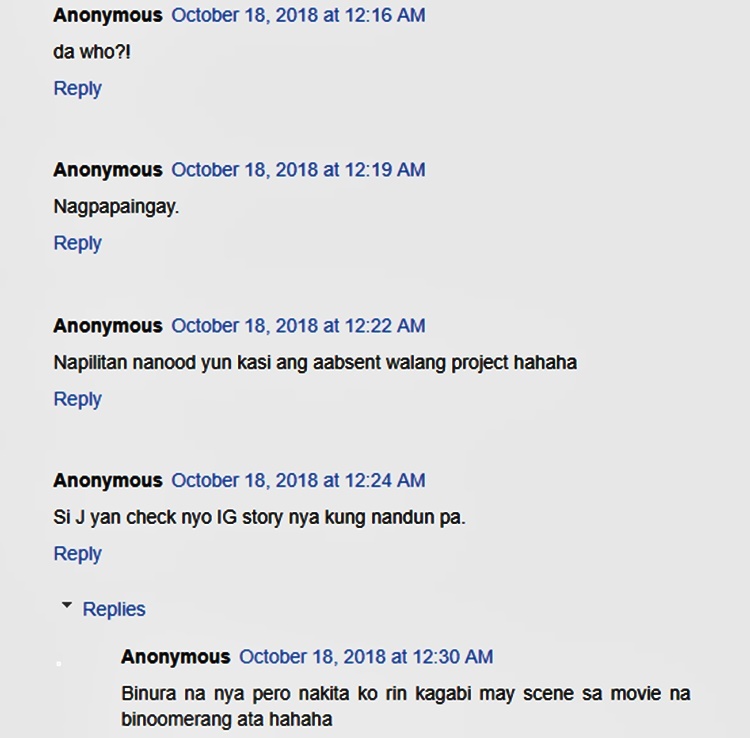 How true is it that Jake Cuenca is the misbehaving actor in a cinema in a particular blind item? 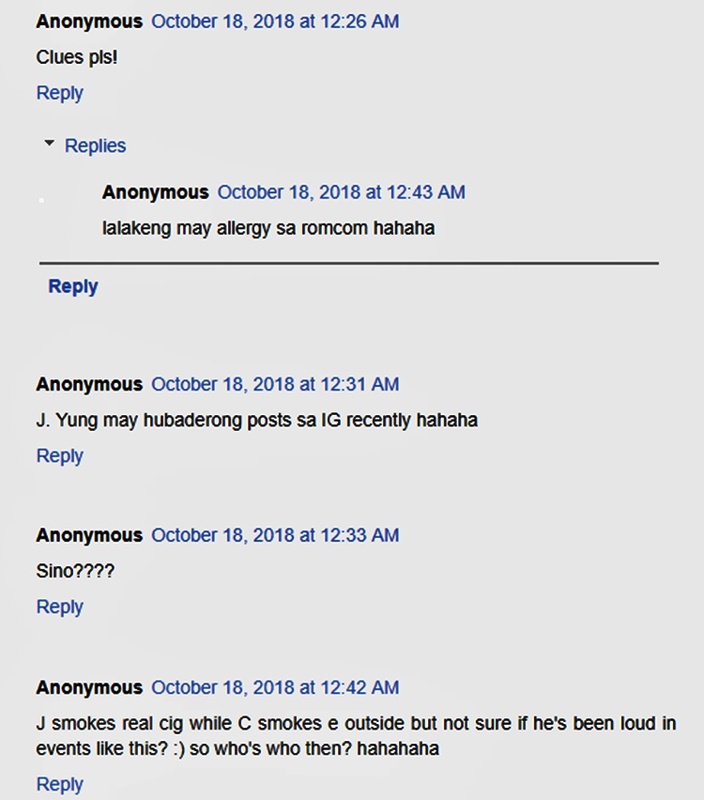 A netizen pointed out that Jake Cuenca is the misbehaving actor in a cinema who is a topic of a particular blind item. The said issue started on a tweet of writer Anj Pessumal. It was shared on a popular site and this received various reaction from netizens. 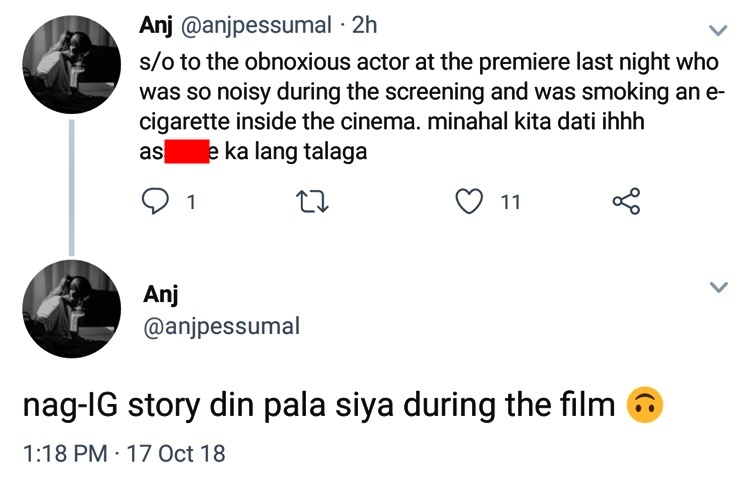 According to the Twitter post of Pessumal, the said actor was smoking e-cigarette inside the cinema during a premiere night. Aside from that, the writer also complained that the actor she was talking about was so noisy. The next tweet from Pessumal stated that the actor also uploaded on his Instagram Stories while the premiere night was on going. Here is the screen shot photo of the writer’s tweets. There were social media users who mentioned that the initial letter of the actor’s name is “J”. That started speculations among the netizens. One netizen said that the actor was just doing things to be noticed. On the Twitter post of the popular site, one netizen named the said actor in the blind item. She even tagged the account of Los Bastardos actor Jake Cuenca. Some netizens gave one clue that the actor who irritated Pessumal during the premiere night is allergic to romcom or romantic comedy. It can be recalled that Jake Cuenca previously commented against the romcom movie Miss Granny of Sarah Geronimo, James Reid and Xian Lim. There were also some netizens who revealed another clue. They said that the actor has “hubadero” posts on IG. Just recently, Jake posted daring photos on his Instagram account.